This morning at 3:50 my body woke up with the off-kilter assumption that the routine was underway. Years ago I responded to such circadian hiccups by trying to will myself back to sleep. Now I prop myself up in bed and practice my trippy marriage of Christian prayer and Zen meditation for as long as it feels right. If my head gets heavy, I lie down and let go. If I’m fresh, as was the case before dawn, I keep going–in this case for sixty minutes. For another hour I pecked out notes on my iPhone, planning church work and making a shopping list: pistachios, avocados, San Pellegrino water (aren’t I refined? ), pinto beans, soy hot dogs, etc. Thinking at 5:00 a.m. about anything positive or even mundane has a spacious quality. The mind drinks cool draughts of sanity. Wonderful! At 6:00, as the maples on Shenley Drive took shape in the first light and the neighborhood cardinal chanted his dawn mantra, I took an hour’s siesta. Yes, siestas are by definition an afternoon activity, but I’m taking a semantic liberty. After two hours of healthy wakefulness, lying down again and drifting off with a lovely breeze on my face and arms and a lovely wife beside me seemed more like a nap than a resumption of night sleep. A little after 7:00 I dressed and creaked downstairs to discover a small envelope on the dining room table. If I weren’t already light and refreshed, the contents would have washed any sludge off my spirit. Son Micah had written me a belated Father’s Day note, full of love and gratitude, and enclosed a Starbucks gift card. Had I not been under the emotional surveillance of Zoloft, I’d have cried. As it was, I rubbed the gift between my fingertips like a feather found on a beach, like a leaf of the lamb’s ear Kathy has growing out front. 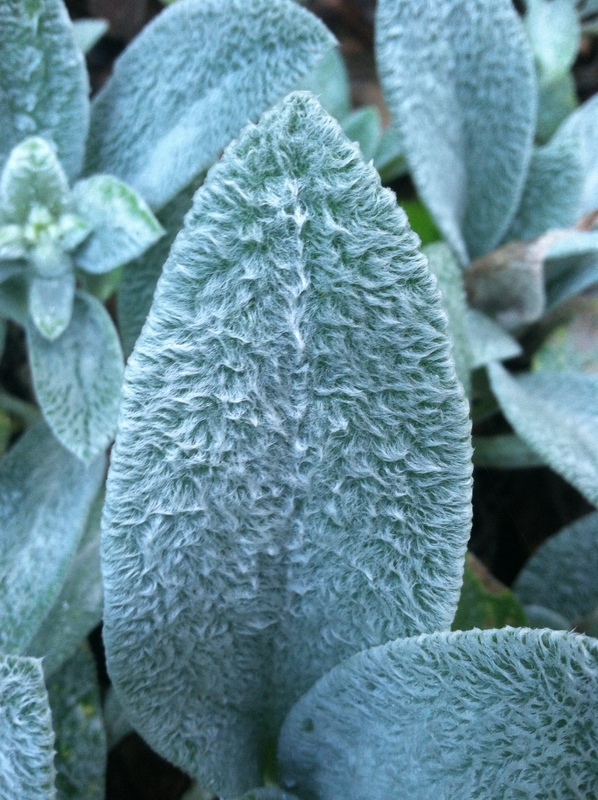 One of Kathy’s lamb’s ear leaves. Driving to church, I decided to record Happy Birthday and send it as a text message to daughter Elena, who turns twenty-five today. One voice in my bush league vocal repertoire is a schmalzy vibrato, and I laid it on thick for my pregnant girl. For a flourish I scooped the last you note. Elena’s text response: “Thx daddy! U just made me laugh cry. Damn hormones!” At 2:22, when I would normally take a siesta, Elena texted me a recording of my dancing grandchild’s heartbeat. Woosh, woosh. Sounded herculean to me, but what do I know? I smiled, but again, wasn’t verklempt. I never did get a nap. Didn’t get a run in either. Obligations took over. I spent half an hour with a parishioner in a soul-strangling situation and drove home gratified that he and I had extracted a couple veins of grace out of a cavern of darkness. In my chest, joy and depression played Twister. Close to dinnertime, I received another text message from Elena, which I paraphrase: “Daddy, any chance I could use my ‘I’ve had a bummer of a day and need my daddy’ coupon?” A couple Christmases ago I stuffed the family stockings with coupons written on index cards. Ever since, Elena and her husband Matt have been redeeming them. Elena and a co-worker hugged goodbye this afternoon as the latter was moving to Columbus. Seeing a dear friend leave combined with those damn hormones had Elena’s tears splashing out. So off the load of us went to Perkins Restaurant, where wife, son, daughter, and son-in-law had a pancake-waffle frenzy. Thankfully, the carbohydrates and bummer coupon brought Elena’s hormones back into balance. Wednesday, July 3, 2013: one ambush of blessing after another. I’m constantly aware that my personal healing from living for years under reality’s fist is taking longer than I’d like, so I’d be a fool to rush this day to a conclusion. 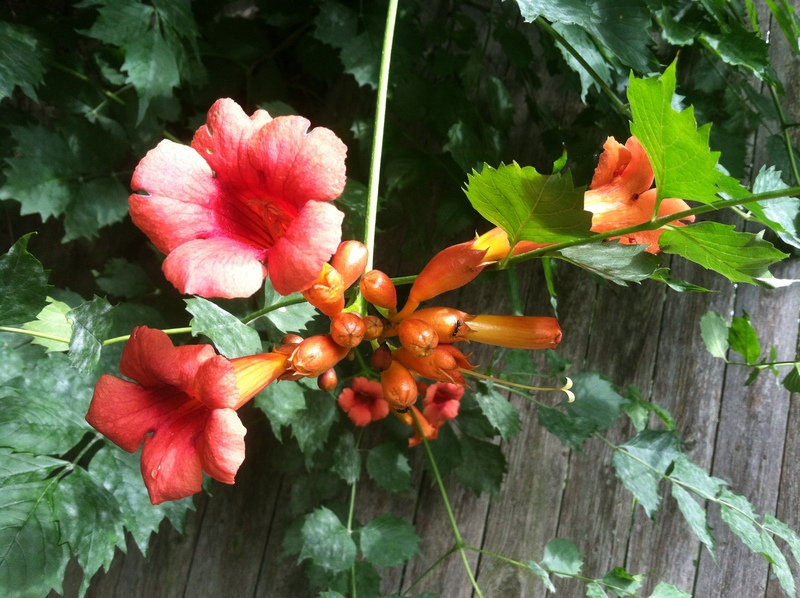 Kathy’s trumpet vine waiting for hummingbirds. When people I love blossom—even those standing throat-deep in compost—I’m going to stop! Shamatha—calm abiding—in an elementary extravagance: a wife who loves me, though my faults are legion; a daughter and son-in-law in giddy orbit around her belly; a son whose true self emerges more each day after being suffocated so long by addiction; friends and parishioners whose goodness keeps making me pinch myself. When I stand upright in the wind, my bones turn to dark emeralds.